Everything You Need To Do Before a Home Renovation #Infographic ~ Visualistan '+g+"
Are you interested in renovating your home? If so, there’s a lot that you need to consider before jumping right in. Before you begin taking on projects or calling the professionals to complete them for you, you need to be prepared. It’s no surprise that home renovations can be very costly, so it’s best to put a plan in place before you get going. In order to create such a plan, you’ll have to do a lot of research to find out what the costs might be, how you’re going to be able to afford all of it and who’s going to be helping with all of the labor. 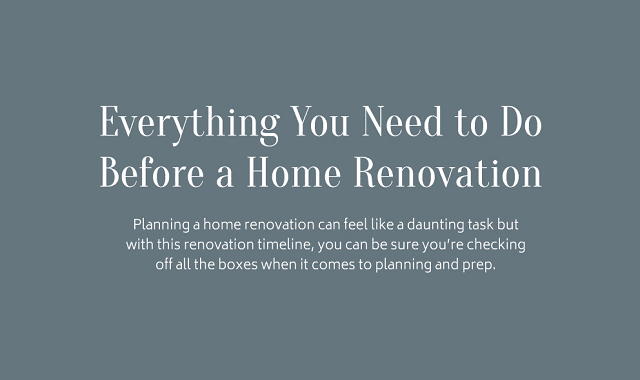 Check out this infographic on “Everything You Need To Do Before a Home Renovation,” that gives you a timeline and serves as a guide before you go ahead and get started in your home renovation process.